Why does the weekend always have to go by so fast?? Like I said last week I could live in a chunky sweater, skinny jeans and heels. I wore this to dinner on Friday night. I got so many compliments on my shoes and I am obsessed with these. These were a random find at a store that I have never been to before and that I have never heard of but I couldn't pass them up. The color and the ankle strap are two of my favorite things. Don't mind my wind blown hair in these pictures. I live close to the beach so I guess that is why it is ALWAYS windy outside. It drives me insane! I fix m hair just to walk outside and have the wind blow it away! Love this casual look, so pretty! Isn't it so exciting the temps in FL have finally dropped enough to wear sweaters! Love your TB bag! I love the pop of color that the shoes add to the outfit!! I'm in love with this outfit! 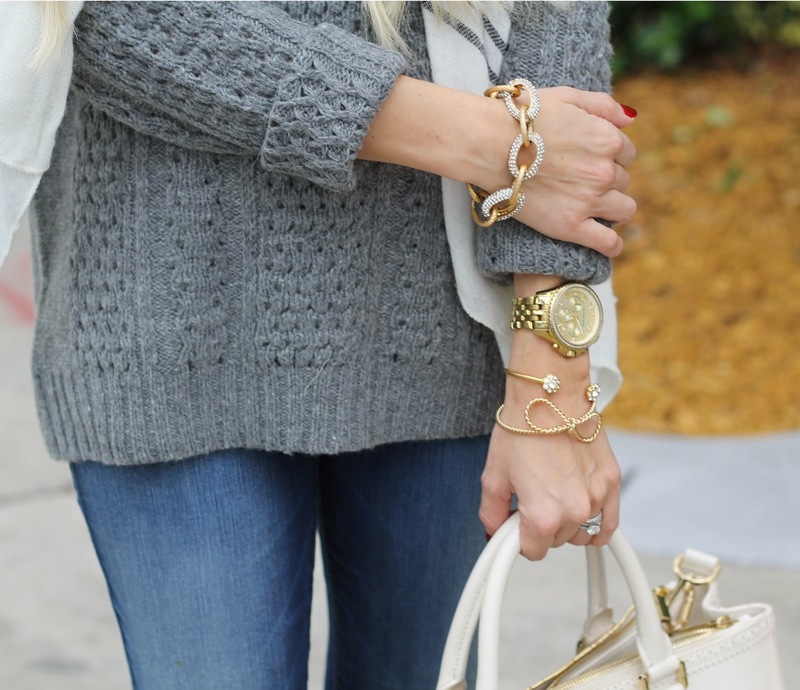 The sweater looks so warm and cozy, and I love the jewelry you paired with it! Love those shoes! So said they were a random find! Good for you - bad for me. I always love your outfits! That sweater is SO cute and I love the bright shoes! Love the gray & orchid combo! love your hair here! i saw the instagram pic from the back and thought it was sooo cool. i will definitely be trying it soon! hope you had a fun date night! Such a cute outfit, adore the shoes, they bring so much fun to the rest! Such a cute date night outfit! Love the chunky sweater and the colour of the shoes!! Adorable! I just really love your style. Your outfits are always so stylish.